The story of the Troubles gains traction in the stormy history of County Londonderry and in the city of Londonderry in particular. The name is itself a source of contention, which from old Irish (Daire) into English (Derry) was renamed Londonderry in 1613, in acknowledgement of donations from the city of London. The Bogside area of the city has been called Free Derry by nationalists since 1969, and in the Republic of Ireland the county is still signposted as Derry. By almost all accounts, the civil rights march through the Bogside area of the city on January 30, 1972, in which thirteen unarmed protesters were shot dead by the British Army, is seen as the catalyst. The Northern Ireland Civil Rights Association (NICRA), which was based on the example of peaceful means set by the National Association for the Advancement of Colored People (NAACP) in America, consisted essentially of disadvantaged Catholics, even though it was fronted by a fair-minded, working-class Protestant man, named Ivan Cooper. Its aims included first and foremost the ending of voter suppression and widespread discrimination in housing and jobs; undone by the events of Bloody Sunday, however, a new set of aims were established. As passion was transformed into untempered rage, the ideology of non-violence was reconstituted into a declaration of war. Hundreds of young Catholic men and women were re-filtered into the IRA; by the mid-70s, the IRA was 1,500 strong, around 21,000 British Troops were in operation in Northern Ireland and 1,981 people (1,874 of them Catholic) interned without trial. Although the signing of the declarative Good Friday Agreement theoretically ended the conflict, it by no means quashed sectarian violence, which proved uncompromising and raged sporadically for several years. The People’s Gallery Murals, a set of 12 commemorative murals to the Troubles, are painted to the ends of the houses of Rossville St. near Free Derry Corner. The winner of the City of Culture Award has yet to dramatically turn the page on its fractured past, and this is reflected in the structure of the city itself, which feels strangely decentered. The walls of Derry, dating back to 1613, were the last to be erected around a European city and are therefore at an almost unique state of preservation. For a mile they loop around the inner city, forming a walkway with which to attend various attractions and historical points. If you are interested in knowing more about this county, you can book this private tour with us! 1. Downhill Demesne and Hezlett House (closed to the general public) both date back to the 17th century. 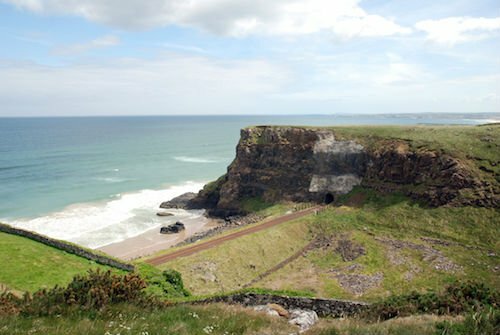 The nearby Mussenden Temple rests on the edge of a cliff (Opening Times: Monday to Sunday from dawn till dusk). All are complimented by a well-kept garden belonging to the National Trust and a ruined 18th century mansion belonging to the Earl Bishop.